LED matrix projects are all over the place, but this one is interesting for its simplicity: it’s an LED matrix that is driven straight from an ESP8266 board. 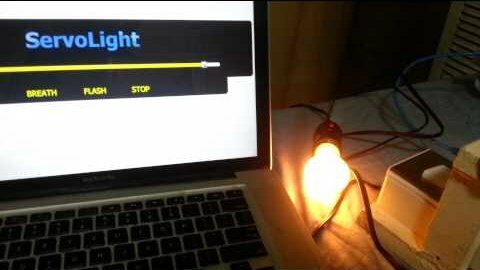 [Ray] put it together as a quick project for his students to teach the basics of LED programming. Just get on the same network and load up the module’s WiFi address for a graphical representation of the 5×7 LED matrix. Pick a color, turn pixels on or off, or choose a predefined pattern and send it to the hardware. This is a powerful way to get use input and with this as a guide it’s fast to set up for pretty much an application you can think of. Just work your way through the documents he put together for the workshop (Zip file link), including all of the code and the slides he used to run the workshop. Here’s an interesting use of a Raspberry Pi to control the PSU on a server. [Martin Peres] is going to be away for a few months and still wants access to his PC. This isn’t really all that tough… it’s what SSH is made for. But he also wants lower-level access to the hardware. Specifically he needs to control and get feedback on what the PSU is doing, and even wanted to have access to the serial console without having to go through the computer’s NIC. The image above shows one part of his solution. This is a custom Ethernet port that connects to his Rasberry Pi header breakout board. Inside the computer the jack is wired to the motherboard power LED to give feedback about the current state of the power supply. It also patches into the green wire on the PSU, which lets him turn on the power by pulling it to ground. After working out the cable routing he developed a web interface that makes it easy to interact with the setup. As with other hacks along these lines letting an embedded computer run 24/7 is a lot less wasteful than leaving a PC on. That’s a concept we can really get behind. Here’s a Raspberry Pi hack that adds web control using PHP and MySQL. As you can see in the image, it serves up a webpage (using the Apache2 server) which allows you to change the state of the GPIO pins. It’s not super-complicated, but it is nice to see a step-by-step guide for installing and configuring the package. Web interface GPIO control is one of the features we loved about the Adafruit Web IDE. But this offering is loaded completely from the RPi (the Adafruit package uses cloud based code) and utilizes the tools most Linux network admins will be used to. A MySQL database manages the connection between GUI commands and GPIO modification. The webpage is served up by a PHP script which takes care of polling and changing database values. Configuration requires a new database, plus the username and password which has access to it. [Stephen] took the safe route when getting his Raspberry Pi to dim an AC light bulb. He didn’t roll his own outlet box with a mains-rated relay inside, going with a mechanical connection instead of electrical. By attaching a servo motor to the dimmer knob the RPi can adjust the light level without risk of electric shock. He is using the ServoBlaster package to drive the servo motor with the Raspberry Pi GPIO pins. That’s all fine and good by itself, but he went the extra mile and designed a few different levels of functionality around the pairing. The motivation behind the hack was to build a sunrise clock that had a lot of power when it comes to luminosity. But he also plied the RPi’s networking features to serve up a web-based control. It has a slider to set the light level, as well as breath (like a slow fade) and flash features. The servo is a bit noisy when moving quickly, but the sunrise alarm takes 30 minutes so the gears don’t really make any noise at all. Check it out in the clip after the break.